A towering structure almost 25-metres high will soon offer visitors to Point Pelee National Park an uninterrupted, 360-degree view of Canada's southern-most point. Canada's Minister of Environment and Climate Change, Catherine McKenna, announced $5.5 million in funding on Monday for projects at the park, which is celebrating its centennial. 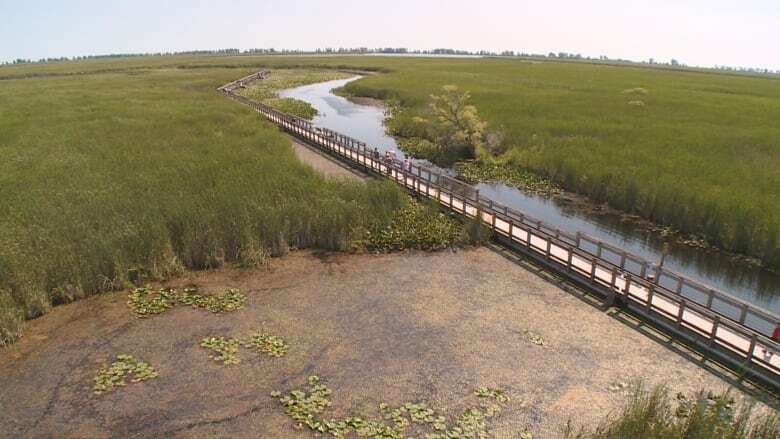 Maria Papoulias, superintendent at the park, said Parks Canada plans to use that money at two of Pelee's most popular destinations — the marsh boardwalk and the park's famous tip. In a media release about the funding, McKenna is quoted as saying 2018 is the "perfect time" to visit Point Pelee. "Through investments to protect and restore our national parks the Government of Canada is preserving nature for future generations," she added. "These investments will help more Canadians, including youth and newcomers, discover and enjoy Point Pelee and the remarkable diversity of species found there." The boardwalk, which rambles for more than a kilometre through cattails and water, will see improvements and repairs, while the tip will be crowned with a massive "80-foot tower." "People will be able to look south over Lake Erie and North from the southernmost point of Canada," said Papoulias. "So they can actually see Canada opening up from the south, which is really amazing." She added the tower will be built on a site that's stable and previously housed cottages, meaning staff won't be disturbing an untouched habitat. The tower will allow visitors to take in the tip, which "changes shape and size every time" from a whole new perspective, said Papoulias. "From that perspective we can engage people in a whole new way and we can tie that to a lot of stories and lessons on the dynamism of nature … the fragile and rare ecosystems they can see around them," she explained. The long-term plans for the investment also include turtle nesting sites along the beach and improvements to the flow of traffic and the flow of water into the marsh. "We are renewing things for people, but we're also making it better for nature at the same time."